Be part of the huge crowd to soak up the twilight festival atmosphere at Towards Zero Race Melbourne on Thursday 24 January, 2018. The perfect way to kick start your Australia Day long weekend. 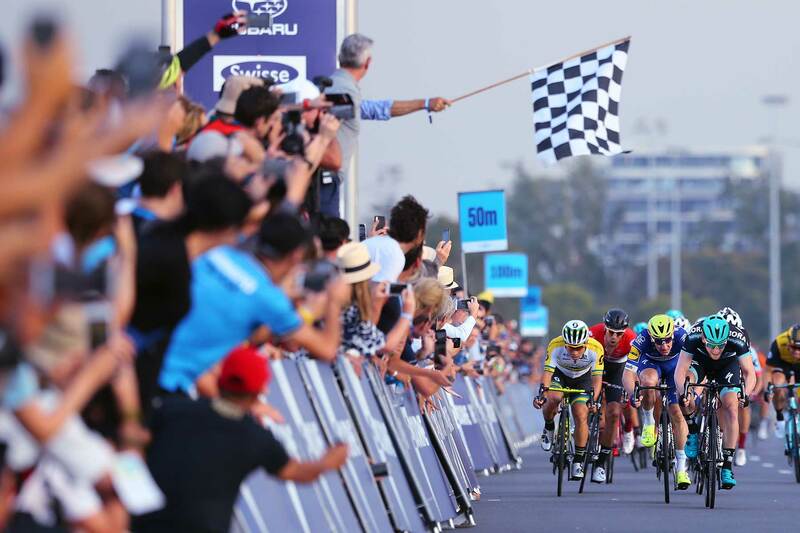 Ride4All – Ride the Albert Park circuit, register here. With so many vantage points at the Albert Park natural reserve to watch the races from, spectators can bring a picnic rug, portable chairs or line the track to see the action up close. Plus, take a look behind the scenes at the team set ups, bikes and cars in the pit buildings. The Start/Finish Precinct Village will also include bike parking, water taps (bring your water bottle), bottled water also for sale, toilets, event information and first aid. With grassy areas available for spectators, you are encouraged to bring a picnic rug. Most areas around the precinct are readily accessible. As there is limited shade available, you should dress appropriately, bring a hat and sunscreen and make sure you drink plenty of water. Please keep a close eye on children, particularly around the roadways. Please keep pets on leads. Catching a tram is a terrific way to access the event. Nearby stops and access points can be seen in the spectator map. Please be advised that bikes are not allowed on tram services. Avoid leaning over barriers or standing on the roadway to cheer the riders and take photos. Riders and accompanying vehicles will be travelling at speed during the race – avoid being a hazard. Please be aware the golf course is open on the day of the event, so it is best to avoid gathering on grassy areas adjacent to the golf course. Please respect the instructions from staff and volunteers on the day of the event, who are there to ensure your safety. Cyclists will need to be mindful of the road closures. Spectators travelling by bike will need to adhere to these closures and follow the pedestrian wayfinding signs to the Start & Finish Precinct, with access from Canterbury Road the most direct and efficient. 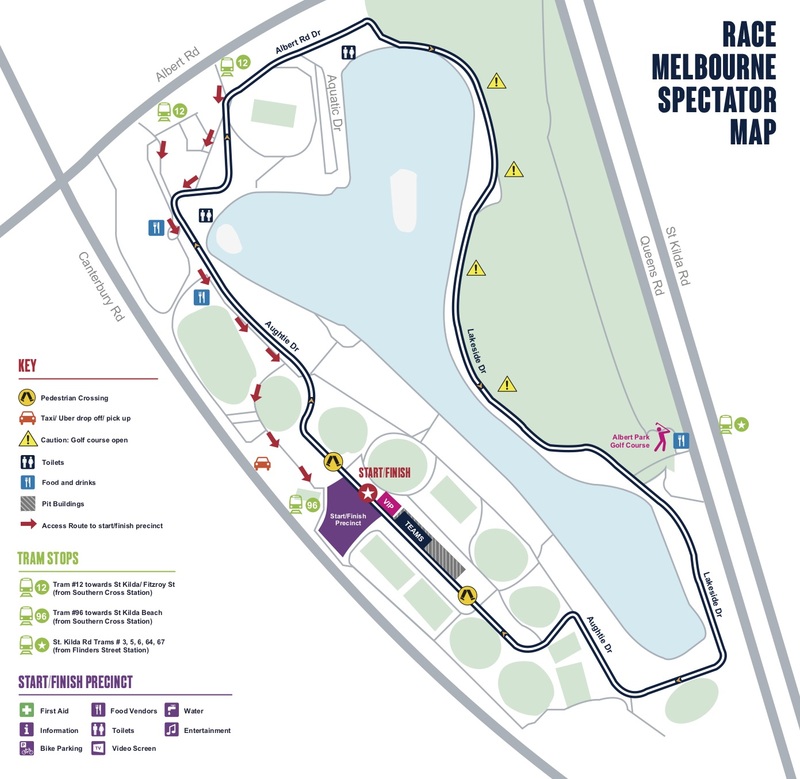 Cyclists using the roads in Albert Park to get to another location should use the pathways in and around the lake in order to avoid roadways. A designated and secure bike parking area will be available for spectators in the start/finish precinct. Police urge everyone to secure bikes at all times and to not leave any valuables, including bikes, unattended in vehicles. There is a designated taxi/ Uber drop off and pick up point along Canterbury Road. There will be very limited to no parking available within the park due to road closures on race day. There is only limited parking available along Canterbury Road and Albert Road. Road closures will predominately be contained to the roads within the Park. Motorists should be aware that surrounding roads and streets may be busier than usual and should allow more time to reach your destination. More information on road closures will be available closer to the event.